Andrew Ellis, 17, of Stone Mountain, isn’t your average teenager. With a vivacious passion for creative movement, Andrew is not only a seasoned ballet dancer with 15 years of experience, but also a third degree black belt instructor of Tae Kwon Do, a self-taught videographer, a b-boy dancer, and most recently, a rising YouTube star. Under the alias “BBoy Georgia,” Andrew combines a talent for videography with a passion for b-boy dancing — a style of dance similar to breakdancing — on his YouTube channel featuring videos of various performances and practices. With nearly 13,000 collective views, Andrew’s creative outlet has clearly found an audience. However, in July of this year on a trip to Ft. Lauderdale, Andrew’s creative process was brought to a screeching halt. 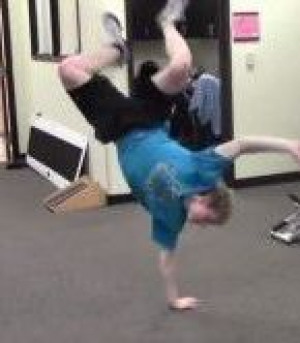 While attempting a difficult flip practicing one of his b-boy dance routines Andrew felt a sharp pain in his left leg. After seeking immediate medical attention, Andrew learned he had sustained two serious spiral breaks in his left fibula. It was this passion that pushed Andrew to seek a second medical opinion when he returned home to Atlanta. Just a few days later, he was seeing Dr. C. Michael Morris at the Resurgens Lawrenceville office. Sure enough, after a successful fibula repair and just a few months of physical therapy, Andrew was getting back to his active lifestyle. Today Andrew has fully recovered from his injury and continues to share his passion for dance with the world through his YouTube channel. To follow along with his creative adventures, visit the “BBoy Georgia” channel on You Tube. Dr. C. Michael Morris received his medical degree from the University of Alabama School of Medicine in Birmingham, Alabama, and completed his medical residency at Georgia Baptist Medical Center in Atlanta, Georgia. His areas of expertise include sports medicine and arthroscopy. He is currently an active member of the American Academy of Orthopaedic Surgeons, Arthroscopy Association of North America, Georgia Orthopaedic Society, and Atlanta Orthopaedic Society.